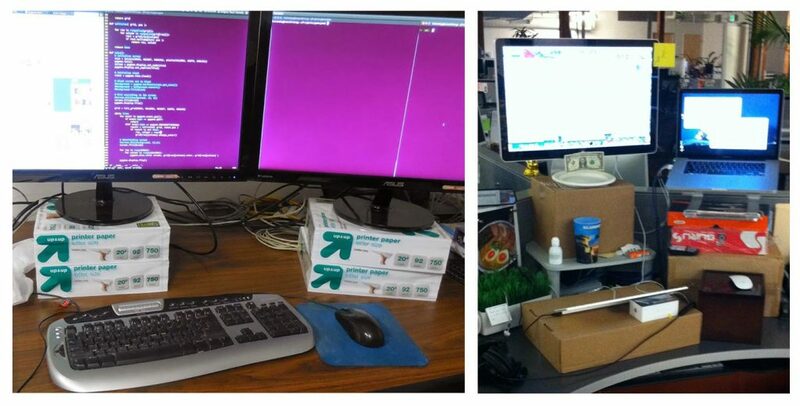 Switching to a standing desk doesn’t mean you have to ditch your dual monitor setup! All you need is a desk or riser big enough to hold two (or more) screens. A surprising number of standing desk solutions, accessories, add-ons, etc., are designed for just one monitor (or just a laptop), so we did some searching and uncovered some excellent desks and risers meant for two monitors. On this page: a guide to choosing the right standing desk solution for your dual-monitor setup. Since everyone’s got slightly different equipment, it helps to know exactly how much space yours needs. If you use an ergonomic keyboard, for example, you might be surprised to find it’s bigger than a lot of riser platforms. Or, you might realize your monitors will hang off some desks. 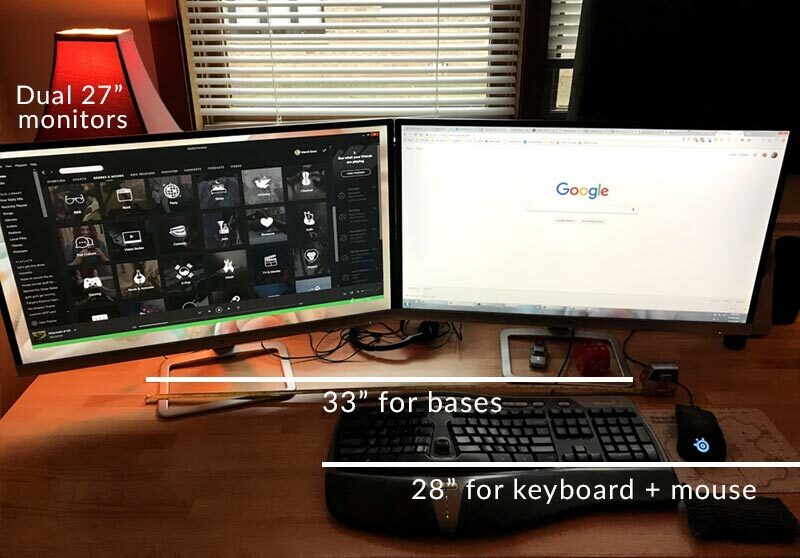 I measured how much space my monitors and keyboard need. The right monitor is my primary screen, and my keyboard and mouse positions reflect that. If you’ve got a dual monitor setup, be sure to consider the placement of the keyboard in relation to the monitors. Some monitor brackets, platforms, etc. place the keyboard dead center between two monitors, which might be uncomfortable since you’ll be smack dab in the center of the two monitors and have to turn your head slightly to use one or the other. Now that you know how much space you need, let’s look at the options! This is my favorite option! 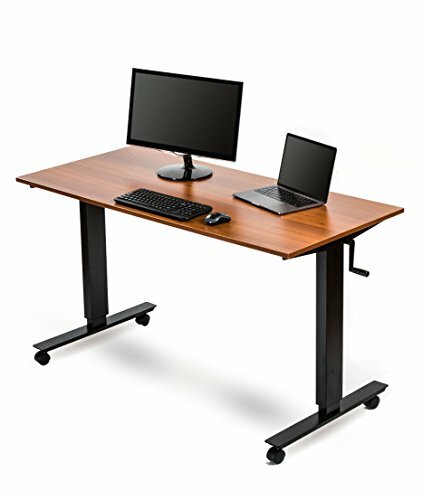 An adjustable-height full-size standing desk gives you everything: plenty of space for two (or more) monitors, fine-tune control over the exact height you stop it at, and the option to turn it back into a sitting desk if the need arises. Adjustable-height standing desks come in two flavors: hand-crank and power-assisted. We think a hand-crank model is sufficient for most users – instead of adjusting the desk up and down all day for breaks, just grab a standing desk height chair and use the crank to fine-tune the desk’s height as needed. They only take a minute or so of twirling the handle and are generally just as stable as motorized standing desks. If you have mobility limitations or know you’ll get a lot of use out of a motorized lift, though, there are plenty of good options to pick from. Here are some great adjustable standing desks that are wide enough for two (or more!) monitors. PROs: We think it’s hard to go wrong with this type of standing desk. Lifting the entire desk is smart – you can use the extra space for notebooks, papers, etc. Some adjustable desks are reasonably priced and some are more of an investment, but they accommodate a wide range of equipment options and users. For instance, there’s plenty of space for an ergonomic keyboard (something that’s often lacking on standing desk converters) and if you ever need to swap or upgrade your monitor(s), you won’t have to mess around with brackets or clamps. If you’re shopping for an office or a variety of users, this kind of desk will suit a variety of heights. CONs: Adjustable desks tend to be the priciest option, but you can save some cash by choosing a hand-crank model. If an adjustable desk isn’t in your budget you might be looking for a DIY solution. There are tons of ways to build a standing desk, but one of our favorite (and simplest) designs is as simple as setting a normal-height desk on a set of bed risers. Found this standing-desk-on-bed-risers in the wild at CodeFellows in Seattle, WA. The desk itself is an older IKEA model. I’ve seen this done successfully with minimalist desk designs, like this IKEA desk sitting on a set of four bed risers, and I’ve done it myself for a couple of my own workstations. The best desks for this are lightweight and have four (or more) legs small enough to fit into the bed risers (most IKEA legs fit). 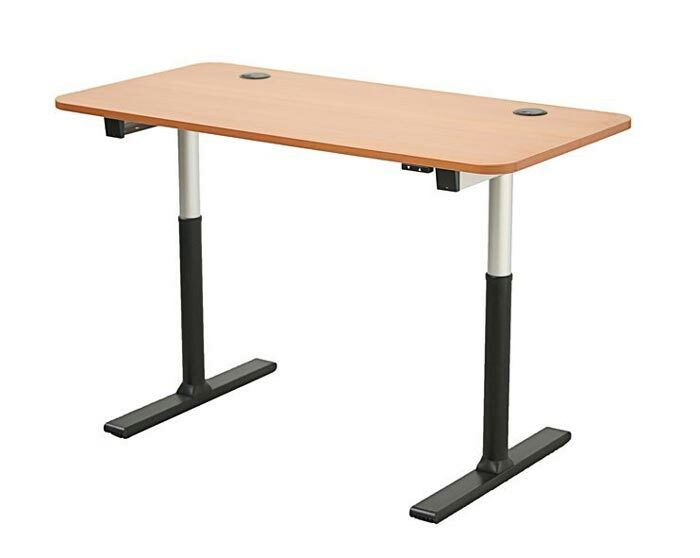 The Simplify 2998 Adjustable Bed Raisers can be used to add 8″ of height to a desk with legs narrow enough to fit into the space on top (IKEA legs fit). 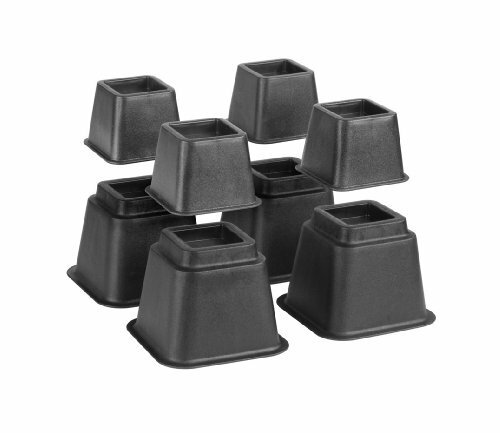 Another interesting option is this powered set of bed risers by Mainstay. One of the risers is powered, with two outlets and two USB ports. 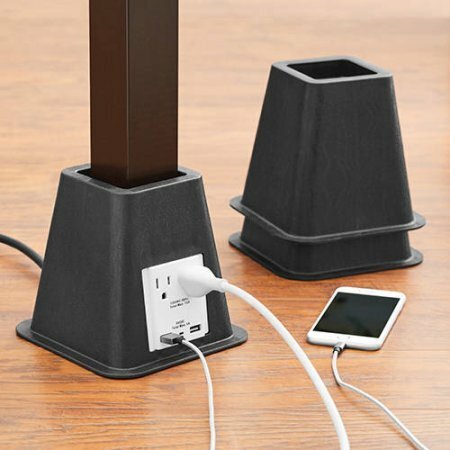 This set of bed risers includes one powered “riser” with outlets for powering or charging your phone, laptop, etc. PROs: I like lifting the entire desk – and that’s the approach I’ve personally taken in both my office and home standing desk setups. I tend to write and refer to a notebook throughout the day and I like my water bottle and desk toys at standing height. Resting your entire desk on bed risers is an affordable “hack”, assuming your current desk is suitable. CONs: This approach only works if your current desk has small legs that can fit into the bed risers, and, depending on the starting height of your desk, the 8 or so inches they add might not be enough for some taller users. As a point of reference, I’m 5’8″ tall. My desk is 30″ tall by default. Adding 8″ brings it to 38″, which is a comfortable height for a standing desk for me when I’m not wearing shoes. Your mileage may vary! Even if you raise your entire desk you’ll probably have to add additional height to your monitors, too. When we sit (or slouch) at a desk we tend to be low in relation to the desktop surface. Even if you lift the entire desk to a good standing height, the same monitor height often becomes too low. I personally like my monitors face-height, which is easy to achieve while sitting but harder to achieve at a standing height. I’ve seen some clever solutions to this problem: standing-desks with monitors sitting on stacks of printer paper, cardboard boxes, books, old hardware, etc. You’ve probably seen it (or done it). If you don’t need a huge boost, this stand by HUANUO adds 4″ of additional height. Office treasure: this simple monitor stand was in high demand at one place I worked. I like the compact design – at 14″ wide it’s not much larger than the base of a typical flat screen monitor and if you’re doing a dual monitor setup they probably won’t encroach on each other unless your monitors are particularly small. 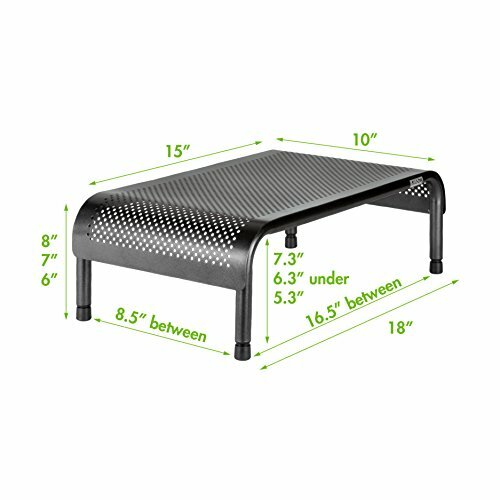 The Allsop Metal Art Ergo 3 Adjustable Monitor Stand is our choice for people who need an additional 6, 7, or 8″ of monitor height. Many monitor brackets add considerable height without sacrificing stability. They make it a little harder to mix and match equipment and tend to work best when you have two identical (or at least similarly sized) monitors. 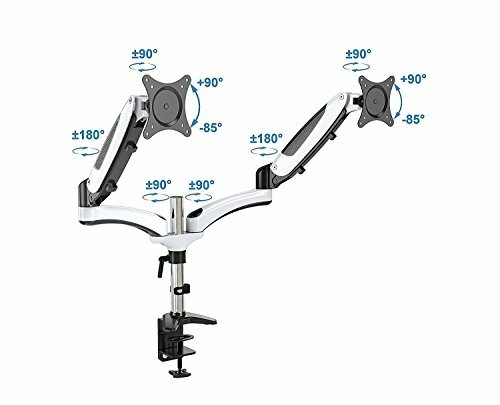 VIVO makes extra-tall monitor mounts that can sit on your desk or clamp onto the edge while offering plenty of ways to position and tilt your monitors. If you want a stand that just sits on top of your desk, the VIVO Dual LCD Monitor Free-Standing Desk Mount is a good choice. 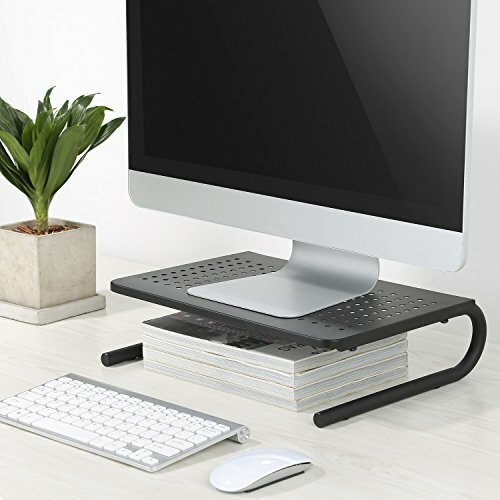 It’s designed to hold two monitors side-by-side, in portrait or landscape mode, and since it’s free-standing you don’t have to drill into your desk or make space for a clamp (though you can if you want to with the optional 4″ grommet). VIVO makes a huge variety of monitor stands and clamps, and they all offer a large range of customization options. The VIVO Dual LCD Free-Standing Desk Mount sits on top of your desk, which is suitable for two monitors up to 27″. 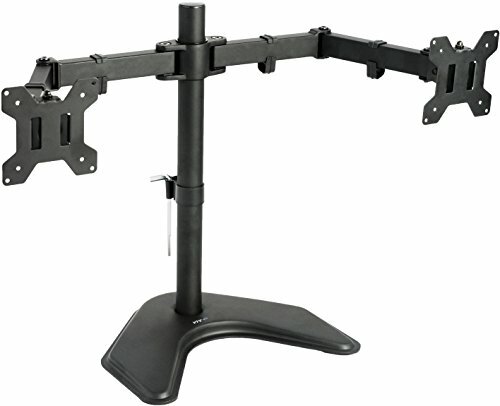 We love this stand’s ability to tilt, swivel, rotate, and adjust the heights of the monitors. If you aren’t using the cable management system in the back, you can place your monitors very low (right above the desk) or quite high (the arm itself is 18″ tall but you can position the monitors anywhere along that height). The HUANUO dual-monitor mount clamps to your desk and lets you put two monitors (up to 27″ each) basically anywhere. A standing desk converter is an apparatus you place on top of your desk and use to lift your keyboard and monitors up to a standing height. Other names (and useful search terms) for these devices are “platform” and “riser”. Your desk stays sitting-height (and you can lower the platform back to a sitting height). These lifts are suitable for workplaces that can’t offer a full-size standing desk and for people who benefit from the portability (when laid flat, they are easier to move to a new workstation than an entire desk). Most models are hydraulic assisted, so you’re not leaning over trying to lift all your stuff with just your own back and arms. 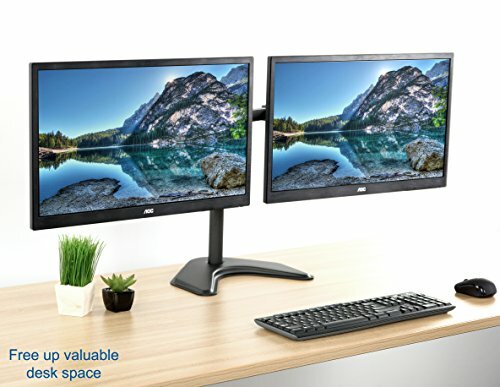 Finding a standing desk converter that can hold two monitors is a bit trickier – if your monitors are smaller you’ll have an easier time finding a suitable converter than if you have large, wide-screen monitors. 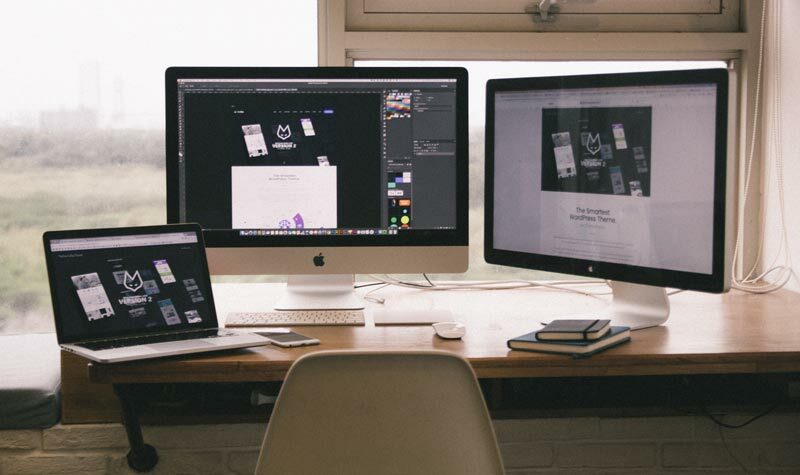 Measure carefully – for my dual 27″ inch setup, some of these desks fall short by just an inch or two. 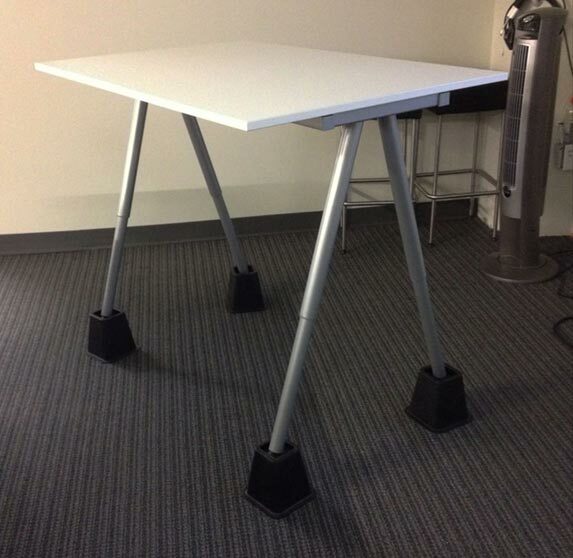 The VIVO Height Adjustable Standing Desk Sit-to-Stand Gas Spring Riser Converter (wow, that’s a long name!) is my top pick for this category thanks to its 36″ wide platform, which is wide enough for a pair of 27″ widescreen monitors, with one caveat: the keyboard platform is too shallow for some ergonomic keyboards, including my beloved Microsoft Natural Ergonomic Keyboard but not too shallow for my also-loved Kinesis FreeStyle 2 split keyboard. So it really comes down to what keyboard you like to use. 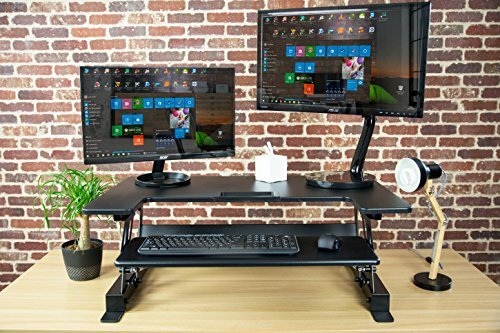 The VIVO Height Adjustable Standing Desk Converter is large enough for two 27″ widescreen monitors but the keyboard platform is too small for some ergonomic keyboards. VARIDESK Height-Adjustable Standing Desk Pro Plus 36 – at 36″ wide you should be able to fit a pair of 27″ monitors on this sturdy standing desk, and the keyboard deck is 17″ deep and 19″ between the supports – it will just barely fit a large ergonomic keyboard, with room for a mouse on either left or right. 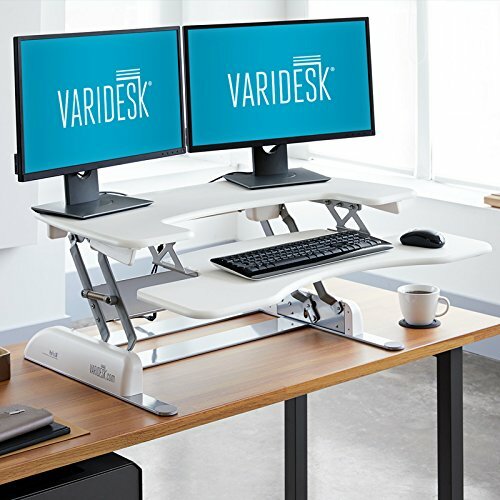 The Varidesk Height-Adjustable Standing Desk Pro Plus 36 is wide enough to hold two 27″ widescreen monitors and some ergonomic keyboards. PROs: Converters are portable (at least, moreso than a full-size desk), sit on top of your existing desk, and they all include some kind of assisted lifting mechanism. Some designs allow you to mount monitors on an arm, which frees up space and might let you mount larger monitors than you would otherwise be able to sit on the platform. CONs: Most of these standing desk converters don’t offer much (if any) extra space for a notepad or your beverage while you’re standing. Many desks have a keyboard platform that is just a little too narrow (or shallow) for an ergonomic keyboard (sometimes called a “split keyboard”). And that’s it– the best standing desks and standing desk converters for dual monitor setups!